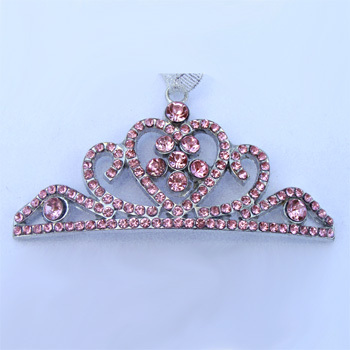 Presenting an ornate Pink Tiara ornament that is fit for the princess in your life. This royalty ornament is a petite version of our larger ornate crowns and features heart-shaped center with hundreds of pronged pink crystal stones. Item ships immediately. Low Inventory! Princess tiara Christmas tree ornaments which depicts a tiara of a princess made out heavy metal and adorned with various sized clear as well as pink crystal stones can be purchased at Designer Ornaments.